Honey is an ancient valuable food and in most cases has enchanted its consumers by its medic characteristics. It consists mainly of Fructose but also contains some amounts of acids, nitrogenous compounds, phenolic contents, HMF, minerals and water. Honey composition according to the studied literature is mainly dependant on its floral source and differs in various honeys. Honey adulteration is a complex problem which currently has a significant economic impact and undeniable nutritional and organoleptic consequences. INTRODUCTION : Honey is defined as the natural sweet substance produced by honeybees. The dietary frauds in particular the adulteration are practices in constant progress. Adulteration consists of adding external chemical substance(s) into a food product that contains naturally similar substance(s). Honey adulteration appeared on the world market in the 1970s when high-fructose corn syrup was introduced by the industry. The authentication of food products is of primary importance for both consumers and industries, at all levels of the production process. Many foods have the potential to be deliberately adulterated, but those that are expensive and are produced under wide fluctuations in weather and harvesting conditions are particularly susceptible; honey is one of such material. Although the adulteration of honey is not injurious to health, problems of honey fraud negatively influence market growth by damaging consumer confidence. Recently, guaranteeing honey quality is becoming increasingly important for consumers, producers and regulatory authorities. The European Commission encourages the use of analytical methods to determine the authenticity of honeys. It seems quite necessary that preparing an overall review of the applied procedures by researchers in detecting honey adulteration would be useful and serve as a good source in oncoming works. By examining the physical qualities of honey, it is very easy to know whether this is pure or impure honey. We are looking at simple ways by which an average day to day consumer can quickly tell if the honey he/she buying is fake or pure. Below are some of the main differences in properties that will help you distinguish between the real and unreal thing. It is very easy to notice the impurities although this may require some practice first. 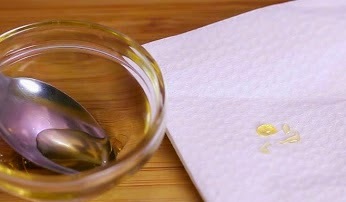 Blotting paper Test:If honey has been diluted with water, it may be absorbed or leave a wet mark on an absorbent material such as blotting paper. Pure honey should not be absorbed, but unfortunately neither will honey diluted with most sugar syrups. 7- Fourier Transform (FT) Raman spectroscopy and Microscopic detection. These methods are all applicable and provide useful information about each aspect of honey authenticity but in order to have an overall and accurate result we should not rely on each technique solely but also do some of them concomitantly. These mentioned methods are described briefly in this review. 2.1.1 Sugar content Sugars are the main constituents of honey. The amount of sugar contents were found at the range of: 45.3-86.0 g/100g for total sugar [7-8], 43.3-93.70 g/100g for total reducing sugar [7 & 9], 64.14-99.30 g/100g for invert sugar [9-10], 20.84-58.38 g/100g for Fructose [9 & 11], 13.5-50.77 g/100g for Glucose [9 & 12], 0.78-1.75 for Fructose to Glucose ratio [13-14], and 0.06-24.8 g/100g for sucrose content [11 & 15]. 2.1.2 Acidity and pH In general, honey is acidic in nature irrespective of its variable geographical origin. The main acid is gluconic acid . The pH, free acidity, lactonic acidity and total acidity of different honeys are at the range of: 3.0-6.5, 0.13-124.2 (meq/kg), 0.0-40.00 (meq/kg) and 0.17-82.00 (meq/kg) respectively [16-19]. 2.1.3 Nitrogenous compounds (Proteins, Amino Acids and enzymes) The level of protein is dependant on the type of flora and thus it is variable . Pollen proteins can be used as chemical markers for honey floral classification. The honey proteins are mainly enzymes. The amounts of nitrogenous compounds of different honeys are at the range of: 199-13100 (µg/g) for protein content, 0.000-0.133 (g/100g) for nitrogen content, 1.58-301(mg/100g) for proline content, 0.18-290 (DN) for Diastase Number and 0.26-127.03 for Invertase Number [7, 13, 15 & 20-21]. 2.1.4 Minor Constituents 2.1.4.1 Phenolic contents Phenolic acids and polyphenols are plant-derived secondary metabolites. On the whole, the determination of the flavonoid patterns is useful for the classification of some but not all unifloral honeys. The amounts of total polyphenols and total flavonoids are at the range of: 2.00-285.7 (mgGAE1 /100g) and 0.91-28.25 (mgQE2 /100g) respectively [11 & 22]. 2.1.4.2 HMF (5- Hydroxymethylfurfuraldehyde) HMF is formed during acid-catalyzed dehydration of hexoses. The HMF content is used as a standard for freshness and overheating of honey. HMF content of various honeys was found at the range of: 0.04-74.9 (mg.kg-1) [8 & 23]. 2.1.4.3 Minerals and trace elements The main element found in honey is potassium, besides many other elements. The amounts reported for Ash content, EC3 , K, Na, Ca, Mg, Fe, Zn, Cu, Mn and P contents are at the range of: 0.03-1.23 %, 0.017- 8.77 (mS/cm), 51.6-21600 ppm, 4.3-727.79 ppm, 6.24-900 ppm, 5.8-139 ppm, 1.13-407 ppm, 0.14-106 ppm, 0.05-35 ppm, 0.07-10.2 ppm, 1.17-100.66 ppm respectively [11, 15-16 & 23-31]. 2.2 Physical properties Knowledge of physical characteristics of honey is important for the different aspects of honey technology: harvest, storage, granulation and liquefaction . 2.2.1 Water content and water activity Water is quantitatively the second most important component of honey. Water activity, measured as aw value is a unit proportional to the free water content in food. aw value < 0.60 are microbiologically stable. Actually, it is the better quality criteria for honey than the water content. Water content and water activity of various honeys are reported to be at the range of: 10.6-29.0 g/100g and 0.483-0.70 respectively [7-8, 23 & 32]. 2.2.2 Hygroscopicity Honey is strongly hygroscopic. Normal honey with a water content of 18.3 % or less will absorb moisture from the air at a relative humidity of above 60%. Equilibrium Moisture Content (EMC), is obtained when the partial vapor pressure of surface water is in equivalence with partial vapor pressure of the environment. In this condition the substance doesn’t either absorb or release moisture . 2.2.3 Viscosity 1 Gallic Acid Equivalents 2 Quercetin Equivalents 3 Electrical conductivity Generally, honey was assumed to be a Newtonian fluid as reported by many scientists [12 & 32]. At high values of shear rate, honey tends to a Newtonian fluid behavior [16 & 33]. There are also some reports which show honey is a non-Newtonian fluid at the studied shear rate [13, 23 & 33-34]. 2.2.4 Thermal properties (Glass transition temperature (Tg)) Carbohydrate constituents have a major role in influencing the glass transition temperature of food systems. Water works as a strong plasticizer in a food system and it decreases the Tg significantly due to its very low Tg of -135 oC. The knowledge of Tg is essential in assuring quality, stability and safety of various food products . The values of Tg for some honeys is at the range of: (-127.19)-(-30.50) [34-35]. 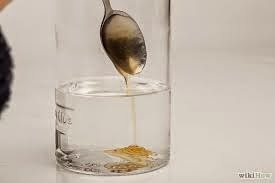 2.2.5 Honey color Color in liquid honey varies from clear and colorless (like water) to dark amber or black. Darker honeys are more often for industrial use, while lighter honeys are marketed for direct consumption. The values of L*, a*, b* and ABS (mAU) of some honeys are reported as: 18.95-101, (-5.06)-27.83, (-10.3)-68.54 and 0.113- 1678 respectively [7-8, 12, 23 & 36]. 3. HONEY ADULTERATION: According to the definition of the Codex Alimentarius and other international honey standards honey shall not have added any food ingredient than honey to it nor shall any particular constituent be removed from it. The detection of adulteration is a technical problem. Honey is subjected to adulterations with inexpensive sweeteners such as corn syrups (CS), high fructose corn syrups (HFCS), invert syrups (IS) or high fructose inulin syrups (HFIS). The adulteration of honey with invert sugar or syrup may not readily be detected by direct sugar analysis because its constituents are the major natural components of honey and the adulterated product would also have similar physical properties to natural honey. Both researchers and Regulatory Authorities are still searching for newer, simpler, and more sensitive and economical procedures [1-2, 5-6 & 37-40]. 3.1 Analysis methods 3.1.1 Gas Chromatography (GC) and Liquid Chromatography (LC) analysis GC and LC have been used simultaneously to analyze sugars in honey. Additions of exogenous sugars could be detected as the appropriate fingerprints of adulteration. This method may be considered as a replacement of isotopic analysis, which has some limitations. In another work, GC–MS method has been developed for the detection of honey adulteration with high fructose Inulin syrups (HFIS) [38 & 41]. 3.1.2 Near Infrared Transflectance Spectroscopy (NIR) Near infrared spectroscopy is a useful technique to evaluate adulteration of honey samples in real time. It is a rapid, non-destructive and relatively inexpensive method which may be suitable for use as a screening technique in the quality control of honey. It has the potential to detect adulteration by either beet invert or high fructose corn syrups at minimum concentrations which may be commercially useful [37 & 39]. 3.1.3 Fourier Transform Infrared (FTIR) spectroscopy with Attenuated Total Reflectance (ATR) FTIR in combination with multivariate statistical techniques (chemometrics) makes possible to obtain specific information about different parameters simultaneously in a direct, reliable and rapid way. In contrast to the time-consuming carbon isotope ratio analysis techniques, these FTIR spectroscopic procedures can be performed in very short time. By the use of ATR mid infrared Fourier transform spectroscopy it has been possible to successfully quantify the content of adulterants such as corn syrup, HFCS and inverted sugar in honeys . 3.1.4 Protein characterization At least nineteen protein bands were detected by silver-staining SDS–PAGE in honeys of different plant origin. Researchers reported that pollen from different plants could be distinguished by SDS–PAGE and pollen proteins can be used as chemical markers for honey floral classification. In addition to variations in the geographical and floral origin of honey, differences in molecular weight of these major proteins in honey were noted. All in all, the major proteins in honey have different molecular weights depending upon the honeybee species. Therefore, the measurement of major proteins in honey is a useful method to discriminate the honey that produced from different honeybee species . 3.1.5 High-Performance Anion-Exchange Chromatography with Pulsed Amperometric Detection (HPAEC-PAD) A simple and easy method based on activated charcoal treatment to fractionate honey carbohydrates followed by analyzing the oligosaccharide fraction by HPAEC-PAD has been developed in laboratories to detect adulterations of corn syrups (CS), high fructose corn syrups (HFCS) in genuine honey samples and bee-feeding adulterations. It is also an efficient tool for the characterization of the honey floral species. This method is less time consuming and less expensive than other methods [6 & 43-44]. 3.1.6 Liquid Chromatography Coupled to Isotope Ratio Mass Spectrometry (HPLC-IRMS) A new procedure to determine individual sugar (sucrose, glucose, and fructose) 13C isotope ratios, using liquid chromatography-isotope ratio mass spectrometry (HPLC-IRMS), has been developed to improve isotopic methods devoted to the study of honey authenticity. The new procedure has advantages over existing methods in terms of analysis time, sensitivity lack of sample preparation, reduced consumption of reagents, and simplicity of the operative procedure. In addition, it is the first isotopic method developed that allows beet sugar addition detection . 3.1.7 Calorimetric methods (Application of DSC) Application of DSC showed the possibility of using the glass transition temperature to distinguish between honeys and syrups and is a powerful technique for characterizing the thermal behavior of honeys and for detecting the effect of adulteration on physicochemical and structural properties of samples . 3.1.8 Stable Carbon Isotope Ratio Analysis (SCIRA) The SCIRA to detect adulteration of honey is a standard analysis technique used for many years. It is determined by the 13C/12C isotope ratio, which is different in C4 or CAM plants (including cane and corn sugar), when compared to C3 plants (most flowering plants from which bees collect nectar). It should be noted that the isotope ratioing technique is only suitable for the detection of honey adulterated C4 plant sugars but not C3 plant sugars. However, by comparing the carbon isotope ratios in the protein and the sugars of honey, which should be the same if they come from the same source, a laboratory can determine if the honey was adulterated, and can estimate the percentage of adulteration by the difference in the 13C/12C ratios between the sugar in the honey and its protein [4, 40 & 45-46]. 3.1.9 Fourier Transform (FT) Raman spectroscopy FT-Raman spectroscopy is successfully applicable to detect beet and cane invert syrups. This method can also be used to discriminate between the types of adulterants irrespective of its floral origin . 3.1.10 Microscopic detection Microscopic analysis of adulterated honeys with cane sugar exhibited parenchyma cells, single ring vessels and epidermal cells. Overall the microscopic procedure is a good screening method for the detection of adulteration of honey with cane sugar products [48-49]. 4. CONCLUSION To sum up, according to the obtained data from studied literature it is to some extent obvious that nearly the majority of physicochemical characteristics of honey depend on floral source. Honey adulteration is a critical problem which is determined by various techniques to get information from each aspect of it. Based on the type of adulterants each applied method seems to be beneficiary by itself. REFERENCES  Codex Alimentarius. 2001. Revised codex standard for honey. (No. CODEX STAN 12-1981, Rev.1 (1987), Rev.2 (2001)).